September marks the tenth annual National Preparedness Month and as an active participant in the U.S. Department of Homeland Security’s Ready Campaign, we would like to share with you some tips on preparing for emergencies and what to do if you lose power. As part of your preparation, it’s important to know what you and your family will do in an emergency situation. Ready.gov provides a helpful template for you to make a plan and share it with each family member. Report outages and downed wires at 1-877-737-2662, online at pepco.com, or using our mobile app. We’ve also created a handbook to help you be prepared before, during and after storms. Please print it and keep it with other essential storm-related items in your home. We are closely monitoring forecasts for Hurricane Sandy which predict that the damage from the storm could be unprecedented affecting the entire Northeast. We have activated all field restoration personnel and have all employee hands on deck to support the effort. We have nearly 600 internal and contract line personnel and 300 tree removal personnel ready for quick mobilization, and our parent company, Pepco Holdings Inc., has requested a total of 3,700 outside crew members through the utility mutual assistance process. At this time, PHI has received commitments for more than 1,800 crew members from states as far away as Texas and Mississippi, many of whom began to arrive over the weekend. In addition, more than 300 customer call representatives are available to answers calls, about 165 assessors are ready to identify storm damage, and around 635 support personnel are working on their storm response roles. 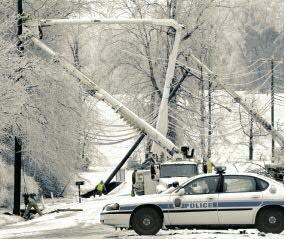 We are preparing for widespread and multi-day outages, and restoring customers quickly and safely is our top priority. As wait for the storm to subside, I would like to share information with you about our restoration process and how our restoration priorities are set. Because this storm is anticipated to stay in our area for several days, it may not be safe enough for crews to work until after the worst of the storm has passed. Our safety guidelines do not allow overhead work to be performed in sustained winds of 35 mph or more, so initiation of our damage assessment and restoration process will depend on when the winds subside. When it is safe for crews to go into the field, we begin a full damage assessment. While damage assessment is conducted, crews are responding to reports of downed wires. However, while the crews work to make downed wires safe, this does not mean power is necessarily restored – especially if there is additional damage to the electric system. In addition to downed wires, our top priority is to restore critical facilities such as hospitals and public health and safety facilities that have lost power. We then work “downstream,” beginning with repairs to the backbone of the electric system and then working our way into residential and commercial areas. This process first considers public health and safety, and gets power to the greatest number of customers as quickly as possible. Chances are that you may never see the utility crew that restores power to your home. The nature of the electric grid means that power is supplied to your home as part of a large, intricate network, so the cause of your outage may be located miles from your home. Just because you don’t see a crew in your area doesn’t mean they aren’t out there. We are working around the clock to restore all customers as quickly and safely as possible; we’re all in this together. 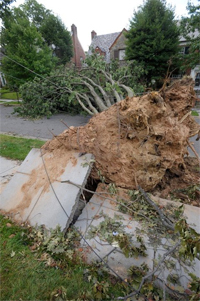 Please report outages and downed wires by calling 1-877-737-2662, using the mobile app or by visiting Pepco.com. You can also follow us on Twitter and Facebook to get tips on preparing for emergencies and updates on our restoration efforts. We are preparing for Hurricane Sandy, which has the potential to cause devastating damage to our service territory. Weather services are predicting that the Washington, D.C., metropolitan area will experience heavy rain and high winds over a sustained period, which could cause widespread and extended power outages. As part of our restoration effort for Hurricane Sandy, we have 150 permanent linemen and 400 contract personnel available. Our parent company, Pepco Holdings, Inc., is requesting an additional 2,500 line personnel through mutual assistance groups. The allocation of those crews who will be available will be determined when we have more detailed projections of where damage is expected to occur on our system. While we are mobilizing for the storm, we encourage customers to prepare for potential power outages and act to ensure their safety. Have adequate prescription medicines and/or infant supplies on hand. If a customer or someone the customer knows uses life-support equipment that requires electricity to operate, identify a location with emergency power capabilities and make plans to go there during a prolonged outage. Assemble an emergency “storm kit.” Include a battery-powered radio or television, flashlight, a first-aid kit, battery-powered or windup clock, extra batteries, special needs items, an insulated cooler, and a list of important and emergency phone numbers. Have a telephone with a cord or cell phone to use as a backup. Cordless telephones require electricity to operate, and will not work if there is an outage. Protect electronic equipment. Unplug sensitive electronics or plug computers and other sensitive equipment into surge suppressors, and consider a UPS (uninterruptible power supply) for temporary battery backup power. Turn off power to flood-prone basement appliances, if it is safe to do so. However, if the customer has an electrically operated sump pump, the customer should not turn off the power. Tune to local news broadcasts for the latest weather and emergency information. Please report outages and downed wires by calling 1-877-737-2662, by visiting Pepco.com or by downloading the mobile app at www.pepco.com/mobileapp. You can also follow us on Twitter and Facebook to get updates on our restoration efforts. On June 29, the violent, fast-moving derecho storm tore through states from the Midwest to the mid-Atlantic, leaving in its wake a 700-mile trail of death and destruction, including 34 fatalities, and significantly impacted more than four million customers. At its peak, the storm left more than 450,000 Pepco customers without power, and a state of emergency was declared in the District of Columbia, Maryland, Virginia, West Virginia and Ohio. We understand the hardship and inconvenience of living without electricity, as caused by the storm, and I would like to take this opportunity to personally thank you for your patience and understanding as more than 3,000 personnel including Pepco forces, and mutual assistance crews worked to restore power. The storm caused significant damage to our critical infrastructure, which needed to be rebuilt prior to restoring power to customers. The restoration effort involved replacing almost 300 utility poles and almost 200 transformers – a significant amount more than what was replaced after Hurricane Irene in 2011. After rebuilding infrastructure, crews focused on restoring power to critical health and safety facilities, and then on restoring homes and businesses. Yet, even with all of the destruction, Pepco restored power to 90% of customers by midnight on July 4, more than 48 hours before our original estimate. We reached 100% restoration just before dawn on Sunday, July 8. According to the Federal Emergency Management Association, more than 100,000 customers were still without power at that time in other parts of Maryland and nearby states. In September 2010, Pepco committed $910 million over five years to improving our reliability. In the almost two years since we began that work, we’ve trimmed over 4,000 miles of trees, enhanced 144 power lines and replaced more than 500 miles of underground cable. Customers served by upgraded power lines experienced a 39% reduction in the average number of power outages of normal day-to-day service during 2011 as compared to 2010, and when outages did occur, they were shorter in duration, declining on average by 56% compared to 2010. Today, we are strong and more reliable – but no amount of strengthening to our system could have withstood a storm of this magnitude. Again, we sincerely thank you for your patience. I would also like to thank customers who took time to show their gratitude – shaking crew members’ hands, and leaving them notes, water and Popsicles, and even sending emails or handwritten thank you notes to the company. We will continue to enhance our reliability, work hard to restore power when storms come again, and keep our customers informed of our progress every step of the way.